Run regular OnSite backups to protect your business data. To keep your information safe, you should also back up before you upgrade, make batch changes, or import from a spreadsheet. We recommend that you have an external backup device or offsite backup strategy to protect the contents of your Mac, including your OnSite backups. Contact a Lightspeed reseller for more information. OnSite 3.8 and later generates this folder structure for your backups on your OnSite server at Macintosh HD/Users/Shared/Lightspeed. Latest backup Contains the most recent backup generated by Lightspeed OnSite. This file is named Lightspeed OnSite Server Backup.lightspeedBackup and contains the images in your database. Daily backups last 7 days of backups. 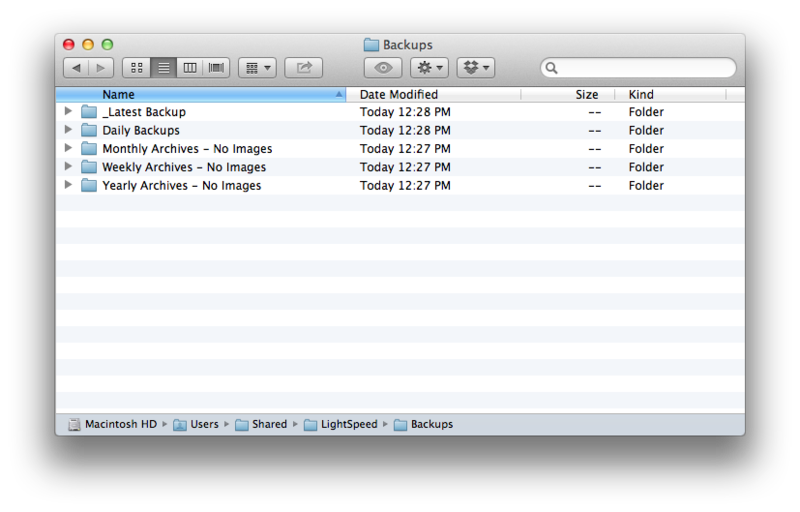 After 7 days, only the last backup from each day is preserved. These backups contain the images in your database. Weekly archives - no images last backup from each Saturday for the current month. These backups are intended for archival purposes. To conserve disk space these backups do not contain images. Monthly archives - no images last backup from each month of the current year. These backups are intended for archival purposes. To conserve disk space these backups do not contain images. Yearly archives - no images last backup from each year. These backups are intended for archival purposes. To conserve disk space these backups do not contain images. OnSite retains your most recent backup in the Backups folder. This backup, named Lightspeed Server Nightly Backup.lightspeedBackup, is the only one that contains all the images in your database. Smart Backups creates additional folders to retain these backups, which do not contain images. OnSite 3.0 – 3.6.8 generates backup files in the Macintosh HD/Users/Shared/Lightspeed folder, in the server1 subfilder. You can have additional subfolders such as server2, so verify the timestamp of any backups prior to restoring. Each OnSite 3.0–3.6.8 backup contains the images in your database. These versions of OnSite do not prune or archive your backup history, so define a backup retention policy to conserve disk space.